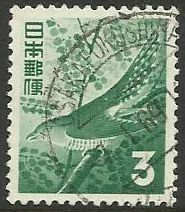 Another nice small definitive bird stamp from Japan, first issued 1952, it was reprinted in 1971 the only difference being the name Nippon was added to the stamp. The legible postmark from Fukushima Ward in Osaka is dated 1969. Lesser cuckoo (Cuculus poliocephalus) is greatly admired for its beautiful song which heralds the arrival of summer.